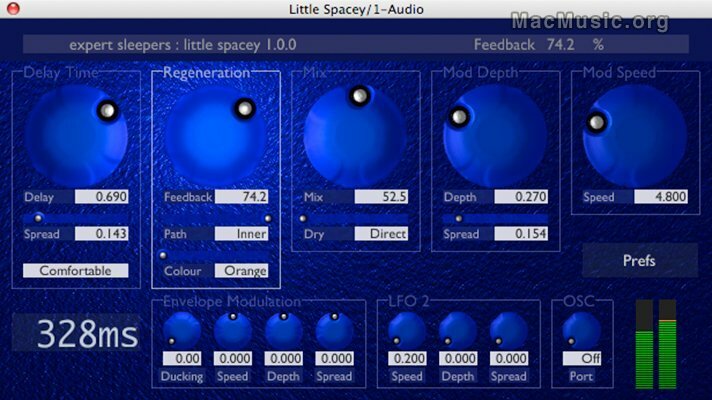 Expert Sleepers has just released Little Spacey, a new delay plug-in for both Mac OS X and Windows. Little Spacey is delay effect, inspired by classic analogue 'bucket brigade' delays but with refinements only possible in the digital arena - not to mention a maximum delay time that would cost a small fortune to realise in hardware. Great care has been taken to give Little Spacey the smooth, creamy sound which makes analogue delays still popular today. In common with the best analogue delays Little Spacey allows you to modulate the delay time for chorus or vibrato effects. Unlike most analogue delays, Little Spacey is not restricted to mono operation, and works well in stereo or multi-channel (AU only) settings, offering variation of the effect between the channels for particularly rich and involving sounds. Little Spacey is available now in VST and AU effect plug-in formats at a price of $29. For a limited time Expert Sleepers are running a special offer, giving customers the chance to get Little Spacey for just $5.